Crispy fried soy fingers are in main ingredient in Warm soy salad dish. 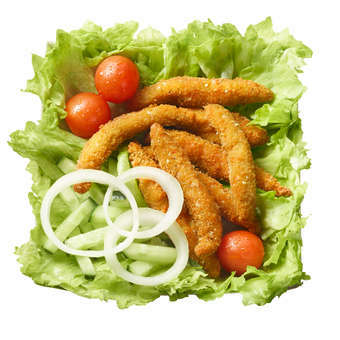 With soy fingers* we serve fresh onion, cherry tomatoes, fresh cucumbers and iceberg salad – Tasty and different choice! The salad comes with your choice of salad dressing and seed mix or croutons. It doesn't get any better than this. * Soy finger: water, breadcrumbs (wheat flour, salt, yeast, wheat gluten, dextrose, potato), soyprotein (14 %), coating flour (wheat flour, wheat starch, salt), rapeseed oil, concentrate vegetable flour (salt, yeast extract, pumpkin, carrot, tomato, parsnip, sugar, parsley, olive oil, nutmeg, thyme, white pepper, bay leaf, coriander, rosemary), chili, lemon concentrate, seasonings (paprika, onion, garlic, black pepper, cayenne). The nutritional information does not include the dressing, seed mix or croutons.